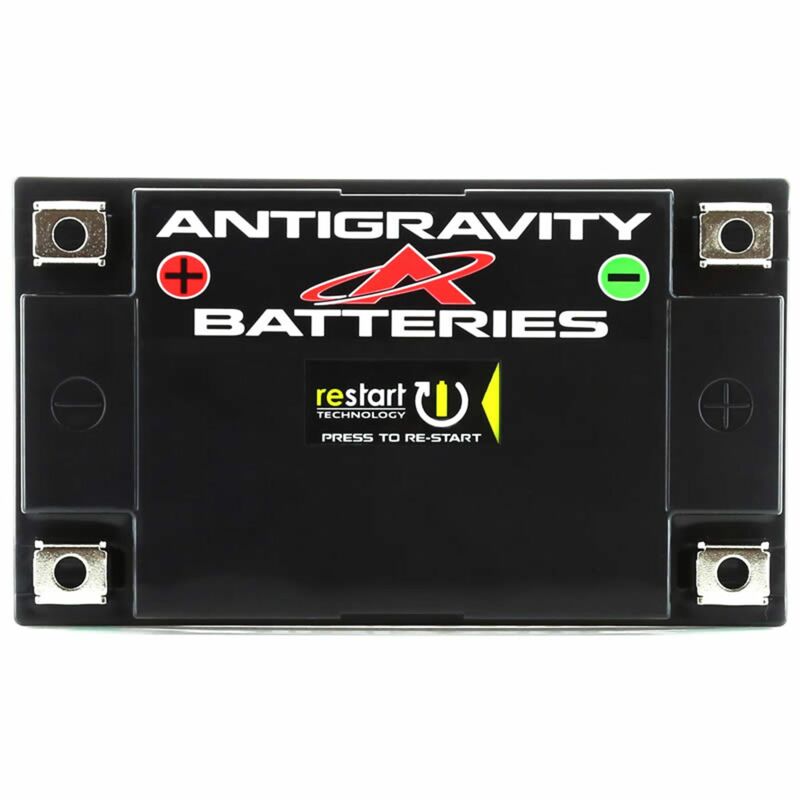 The NEW Antigravity ATX30-RS battery is built with Antigravity's groundbreaking RESTART Technology (built-in jump-starting) so you won’t ever get stranded with a dead battery again! 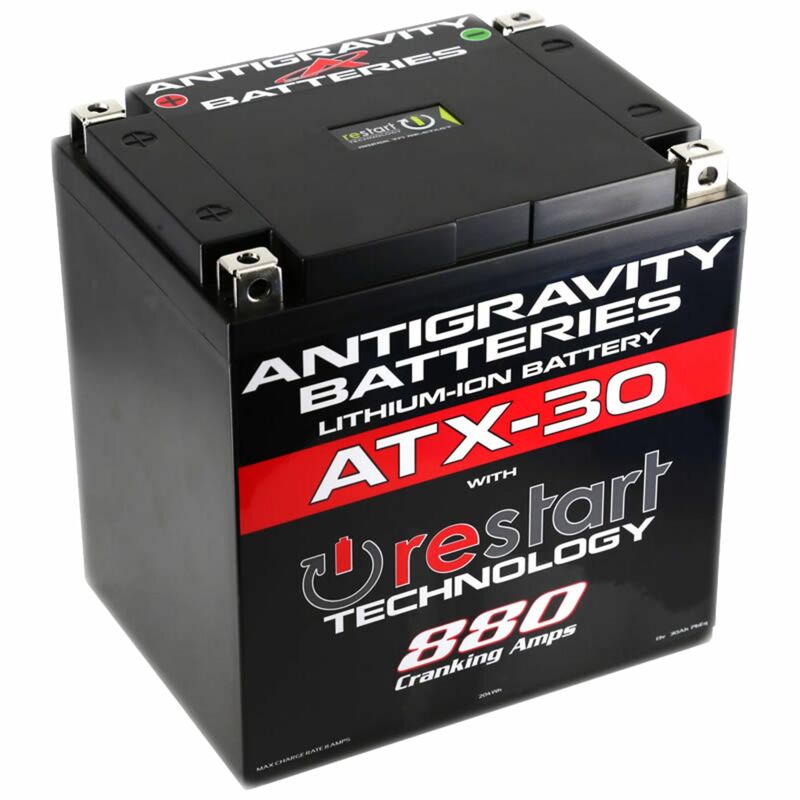 The ATX30-RS is a hi-power, lightweight Lithium-Ion battery that directly replaces the OEM Lead/Acid YTX30, YTX30L-BS, YIX30, YIX30L-BS, hYIX30HL, HVT-2, and the GYZ32HL. The revolutionary ATX30-RS RE-START Battery intelligently monitors its status, and just before going completely dead puts itself to sleep with just enough energy to get your vehicle started again. Simply press the RE-START button located on the battery, start your vehicle and drive away… No more dead battery emergencies or being stranded! The new ATX30-RS is an extremely lightweight and high-power Lithium-Ion replacement battery for the heavy lead/acid YTX30 or YIX30L battery found in many Motorcycles and Powersport Vehicles. The ATX30-RS offers the first FULL Battery Management System (BMS) found on a Powersport Battery and includes low-voltage cut-off, over discharge, over-charge, and thermal protections with real time lithium-ion cell balancing. Excellent for Harley Davidson Touring Bikes and other large Touring bikes that use the YTX30 size batteries. *Must be using ring style terminals as this battery does not have flush mount connections. Excellent for use in Performance and Race Cars of all types including large V-8 Racing Motors up to 800 Horsepower. Do you own the AG-ATX30-RS? Please, tell us what you think about it. It helps us provide you with better products. Please note that it may take up to 72 hours for your review to appear.